NO LONGER SELLING TICKETS! HOPE TO SEE YOU NEXT TIME! THERE ARE STILL SEATS IN OUR LEVEL 1 TRAINING IN MARCH WHICH YOU CAN FIND BELOW. The Art of Connection Valentines Event is a 3-hour workshop designed to offer access to a deeper connection with your partner. It incorporates the work of Authentic Relating which is a set of practices designed to cultivate intimate, trustable, empowering and nourishing connections and relationships. This one time Valentine's event is designed to give you and your partner a chance to slip out of routine and add a dose of depth to your connection. 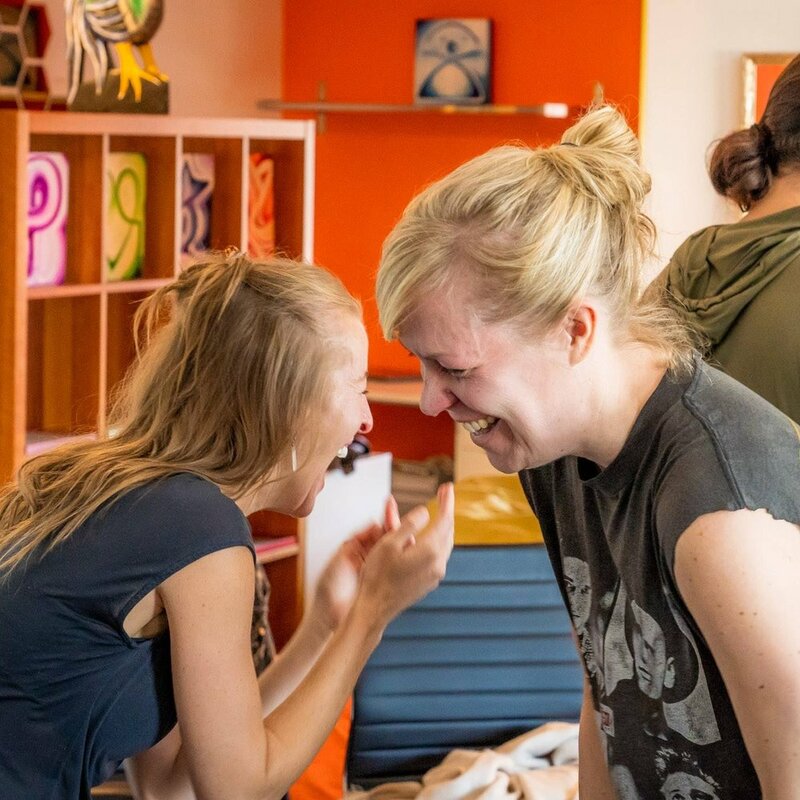 In a relaxed and nurturing space, you will be guided in practices that enable depth of connection and understanding, some gentle physical contact, some playful interaction, and some chocolate dipped strawberries! No pressure and no Hallmark card necessary. Just come as you are, with your loved one in tow, and we’ll take care of the rest. We feel utterly confident that you will walk away with a great experience, some tools to play with later, and a high likelihood of wanting to get even more intimate when you get home. Wink wink! Come join Jahmaya Kessler, LPC and Laurie Lazar for a memorable Valentines event. Jahmaya Kessler and Laurie Lazar lead Authentic Relating Courses within the community, for businesses and behind bars in prisons. We have a seasoned co-leadership dynamic, that is playful and polished. Each of us brings a wealth of wisdom and experience to the table. Jahmaya is a Licensed Professional Counselor with a private practice, who has teaching therapeutic groups and trainings in Boulder for the last 6 years. Laurie holds a Masters in Education, is a long time veteran authentic relator, and is the Executive Director of Authentic Relating International. Together they are committed to enriching people lives and the world through deeper connections. Authentic Relating is a set of principles and practices designed to cultivate vulnerable, intimate, trustable, empowering and nourishing connections and relationships. The practices have personally offered me a much greater ability to take my masks off, be real, as well better equipped to perceive and receive others. It's a deeply embodied practice that has helped me to reconnect my body with its emotional intelligence. It has swiftly become one of the most transformative practice I've ever come across - personally, relationally, and spiritually. Authentic Relating has dramatically impacted my relationships with my partner, my kids, my friends, it helped me acquire a TEDx gig, and made it much easier to stand up on that TEDx stage with embodied confidence. One of my favorite aspects of this practice is that it's fairly accessible, portable, and requires almost no prior beliefs or philosophy going into it. So much so, that I am devoting a lot of time and effort to the mission of helping spread this practice into Correctional Facilities all over Colorado. Laurie Lazar and I will be captaining this journey. We have both been offering trainings within the community and behind bars in prison. We have a seasoned co-leadership dynamic, that is playful and polished. As you may know, I am a Licensed Professional Counselor with a private practice, who has teaching therapeutic groups and trainings in Boulder for the last 7 years. Laurie holds a Masters in Education, is a long time veteran authentic relator, and is the Executive Director of Authentic Relating International. Together we are committed to enriching people lives and the world through deeper connections. This is sure to be an outstanding workshop and is being offered at a great price! I highly recommend snagging one of the limited slots before their gone! Hope to see you there! Coming SOOn: WHO AM I IN RELATIONSHIP? This course will offer an in depth exploration of who you are in a relationship. Through offering the fundamentals of attachment theory, archetypal exploration, imago therapy, and much more - you will walk away with a much better sense of who you are in relationship, and how to transform the role you may find yourself playing over and over again. Subscribe below if you want to be updated of the next course offering.